Overview: The Adventures of Galactic Gopher has a comical outer space feel. The slot offers action for everyone through an entertaining combination of Wild, Multiplier, Scatter, Free Spin and Gamble features guaranteed to deliver entertainment and the opportunity to score out-of-thisworld rewards. 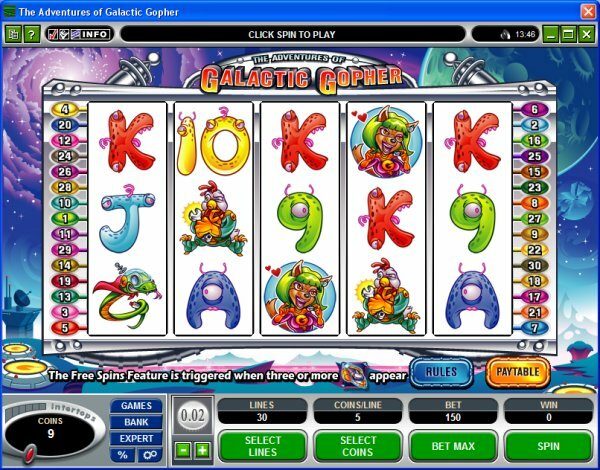 The Adventures of Galactic Gopher is a 5 reel, 30 pay-line video slot with a way-out theme populated by imaginatively weird and colorful aliens having a ball as they present a variety of winning features to you. 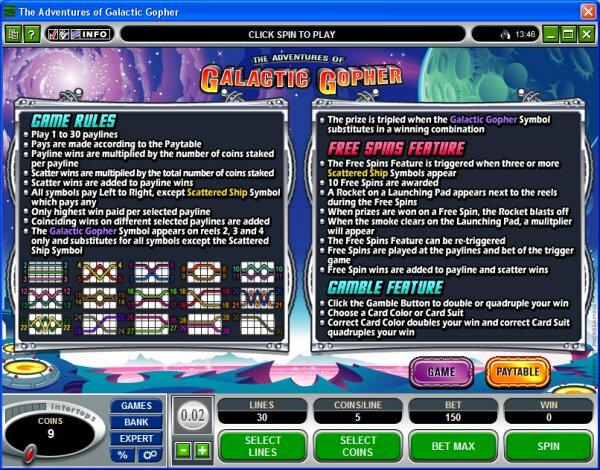 The key symbols in this game are the spaceship and the Galactic Gopher himself, with the critter running Wild and the ship operating as the Scatter...and the key to a Free Spins feature. This delivers up to 10 retriggering freebies, but keep a sharp eye out-where a rocket blasting off indicates a mystery multiplier win as the smoke clears. 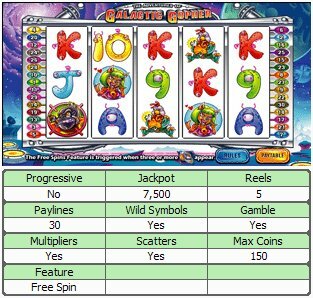 Similar Slots: If you like The Adventures of Galactic Gopher, you might like these other 5-reel slot machines: Bars and Stripes, Inca Gold, Monsters in the Closet, Silver Fang, Supe It Up, Truck Stop.